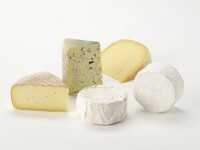 A selection of cheeses sourced from Ireland, chosen to provide an exciting and well-balanced cheese board. An exciting selection of Irish artisan cheeses. Celtic Capra (pasteurised, vegetarian rennet) - A mellow goats cheese with a herby flavour.